For years, grid vendors have been vying for Duke Energy (DUK), the biggest utility in the U.S., which has about 4 million customers still awaiting smart meters. Now it looks as if Itron (ITRI) and its IPv6 grid networking partner Cisco (CSCO) have won Duke’s interest -- not just for smart meters, but for distribution automation, distributed generation, and a whole host of distributed intelligence, embedded sensing applications. “Duke will use our flexible, multi-service IPv6 platform to support grid applications such as distribution automation, volt/VAR optimization and distributed energy resource management,” he said. That’s the network that Itron has developed with Cisco, and which the partners have deployed with utilities like BC Hydro in Canada, National Grid in Massachusetts, and Hong Kong’s China Light & Power, and which the firm announced last month it would deploy with FirstEnergy’s four Pennsylvania utilities. Duke will also be developing projects with Itron’s 4G LTE cellular solutions, Mezey said. Duke has already been working with Itron for a number of years, most recently to bring smart meters to about 240,000 customers in both North and South Carolina. But beyond those projects and the 700,000 smart meters it deployed in its Ohio service territory around Cincinnati, Duke has largely held off on the massive AMI deployments we’ve seen from many other U.S. utilities. In addition, “Duke and Itron will collaborate to introduce new grid applications using Cisco’s IOx operating system for the utility’s 'meter-as-a-sensor' project,” he added. That’s a nod to the work that Cisco has been doing to open up its grid routers to Linux-based applications development, and that Itron has been doing to bring “embedded sensing” capabilities to its smart meters. It’s also a nod to Duke’s unusual choice of architectures for its advanced metering infrastructure deployments so far, centering on a multi-communications capable grid node, which aggregates multiple smart meters with other grid edge devices. 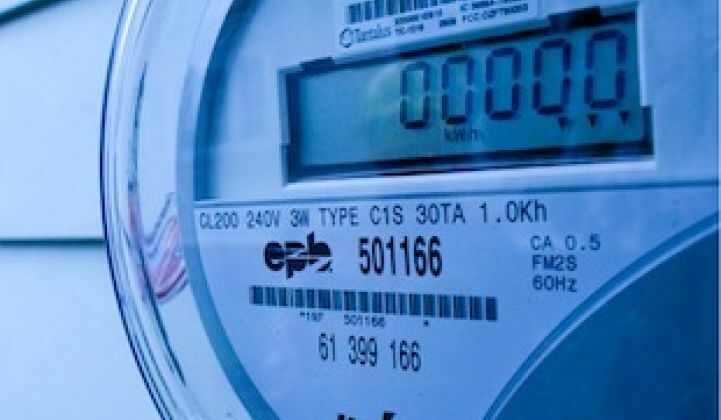 So far, that architecture has been rolled out in Ohio, where it includes smart electric meters from Echelon (ELON) and communications nodes from Ambient. It’s also part of Duke’s Charlotte, N.C.-based McAlpine pilot project, where the utility and a coalition of grid vendors are working on a variety of interoperable, distributed intelligence-equipped grid edge capabilities. UPDATE: A Duke spokesperson contacted by email Friday morning sent us the following statement: "We are working with a number of vendors on the development and implementation of a smart grid program that's open, scalable and delivers the most benefit to our customers and overall grid operations." She declined to comment further. According to Mezey's statements in Thursday’s conference call, Duke will be looking beyond those partners, and toward Itron and Cisco, for the next phases of its deployments. This is not an unexpected development. In 2011, Duke canceled its orders of Echelon’s grid-edge node devices, which it has been testing for potential deployment in other areas. Ambient, for its part, reported in October that it was seeking “strategic alternatives” that could include a sale of the company amidst continuing losses and declining revenues, based on the completion of its work with Duke in Ohio. That could be happening across several key markets, including the Carolinas, as well as Indiana, where state regulators rejected Duke’s $22 million deployment request in 2011. “As [the utility] continues to saturate the geographies in which it is currently working and continues to work with the regulator in Indiana for approval of that project, [Duke's] intent is to use Itron technology,” Mezey said. That makes it unclear just when Itron’s work with Duke will enter into the company’s backlog, not to mention when it will have an impact on the company's financials. Sean Hannan of Needham & Company wrote in a Friday analyst note, “We believe this is a major win that supports the long term and will add to bookings and backlog down the road." Itron reported first-quarter 2014 revenues of $475 million and a GAAP net loss of $254,000, or 1 cent per share, compared to revenue of $448 million and net income of $2.6 million, or 6 cents per diluted share, in the first quarter of 2013. It also reported quarterly bookings of $745 million and a twelve-month backlog of $614 million and total backlog of $1.3 billion. The Liberty Lake, Wash.-based company has been restructuring after a poor financial showing in 2013, with the aim of revitalizing its electricity metering business, which has lagged compared to its natural gas and water metering businesses. The deal with Duke doesn’t alter the immediate financial picture, but it does seem to bolster Mezey’s point, made during Itron’s fiscal year 2013 conference call, that the company is moving away from commoditized metering products, and toward its next-generation smart grid technology, in order to change that equation. Itron also announced its first big win in Japan, where it will provide the head-end AMI software for Mitsubishi Electric Company (MELCO) for a 10 million smart meter deployment for utility Chubu Electric Power. Itron fought for Japan’s first big smart meter contract with Tokyo Electric Power Co., but lost out to Toshiba’s Landis+Gyr.